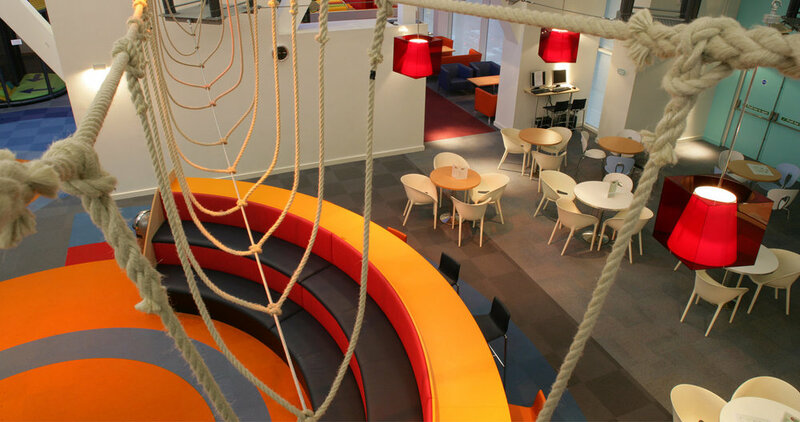 In 2005, Hadfield Cawkwell Davidson completed work on a complete fit-out of Kidspace facilities in Romford and Croydon. Since then the partnership has evolved to encompass many projects and refurbs across a number of sites. Working collaboratively between Architecture, Interior Design and Engineering, HCD was able to offer a comprehensive compliment of services. We worked closely with the client to create a bold and exciting space for children to enjoy as well as providing a complete graphic overhall and an overarching blue-print for successfully implementing interactive elements that encourage imagination and safe play. Branding played a large part in the project, completely overhauling the space to reflect the look and feel of the Kidspace brand. Indeed, our interior design for the space won awards for the implementation of graphical signage built into the carpets and walls of the space. By using these subtle measures we were able to create a scheme that is both easy to navigate and allows kids to get lost in their own world. Challenging elements of the scheme included creating a robust environment for childrens’ play that gives scope for adventure and fun while also adhering closely to health and safety and fire safety regulations. Another aim of the project was to create comfortable areas for parents, where they could relax whilst also keeping an eye on their children. Our experience in creating kids crèches across many leisure centres allowed to us to successfully combine these adult areas with exciting childrens’ spaces. Interactive elements were scattered across the building for kids to enjoy such as pheumatic blasters, tipping baskets and hyper blowers, giving kids new ways to play.